» SEE generic bus stop schedule - NOTE final schedule will depend on the residences of the girls attending each session. - Forms for ADULT VOLUNTEERS and GIRL AIDES are due at the time of application. 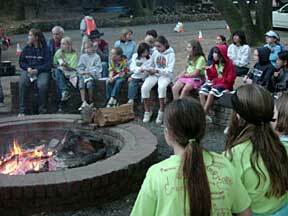 - Forms for CAMPERS are not required until they are accepted at camp and assigned to a session. - Forms must be completed and mailed via US Post. Until January 31, full-time adult volunteers and girl aides — ONLY — may apply for positions at camp with NO application fee. During this time, if you apply as full-time volunteer, you may also submit applications for any of your children who want to attend camp. 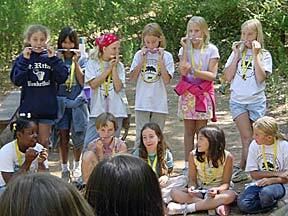 You and your children are GUARANTEED a place at camp if you apply by January 31. - When you apply as a full-time volunteer or Camp Arequipa aide, you also agree to attend a MANDATORY training on SATURDAY, May 11 AND the Site Safety Training the day before your session. Your camp director may also schedule a session specific training date. - After February 1, applications will open for everyone, and will require a $25 per person deposit. Applications will open for everyone, with a $25 per person deposit required. We strongly urge you to apply and pay any fees online using PayPal. We will accept checks mailed by US Post, but please be aware that applications are NOT considered complete until payment is received. After this date, applications may still be accepted, but will not be part of the lottery. Applicants will be placed on a wait list, depending on the number of applications received. – Acceptance to camp (session assignment) and request for balance due. Applicants have TWO WEEKS to make payment in full. – Placement on waitlist. If waitlisted applicants decide not to remain on the list, they have TWO WEEKS to request refund of the $25 application deposit. APRIL 26: DEADLINE for payment (accepted applicants) or refund request (waitlisted applicants). - Accepted to camp: If payment is not received by this date, applicant will be dropped from camp. The $25 application deposit is forfeit. Camp attendees (children and adults) must must also submit the required forms between March 18 and April 24. – Waitlisted applicants: The $25 application fee is not refundable after this date. Any refunds requested will be made by April 24. Forms are due within two weeks of notification of placement in camp. MAY 11: MANDATORY TRAINING for all volunteers - Meet the Director. NO REFUNDS will be made for cancellations made within three weeks of the beginning of any camp session. - AFTER May 27: NO REFUNDS made for Session I cancellations. - AFTER June 3: NO REFUNDS made for Session II cancellations. - AFTER June 17: NO REFUNDS made for Session III cancellations. - AFTER June 24: NO REFUNDS made for Session IV cancellations.